This section will show you how to set up custom application directories and upload custom Adobe server-side scripts to your Inﬂuxis account using a third-party SFTP client. 1. Once you have logged into your account navigate to the “DevCenter” button at the top right. On this page click on the “SFTP Access” tab and you can set the SFTP password. 3. 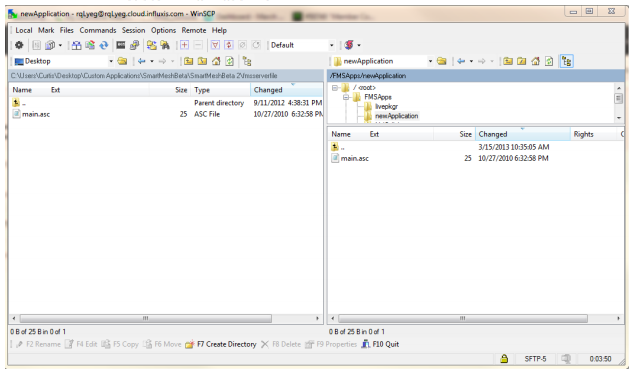 With login information you can connect to your SFTP client and navigate to the FMSApps directory (in the example we use WinSCP). * The "ManagedContent" directory stores all of your encoded files from the "Upload" feature and does not need to be accessed. 4. 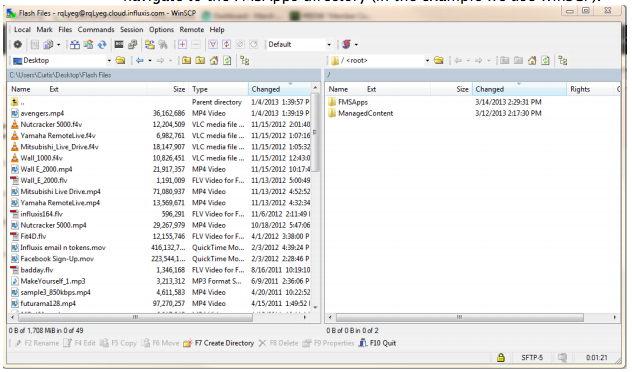 When you are in the “FMSApps” directory you can upload your custom server-side scripts or Adobe Media Server ﬁles. Below, we created a new directory to connect to named “newApplication” and uploaded a custom main.asc ﬁle. * Please keep in mind if you upload any video ﬁles using SFTP and not the built-in Upload system your ﬁles will not be re-encoded and will not be available for mobile playback.